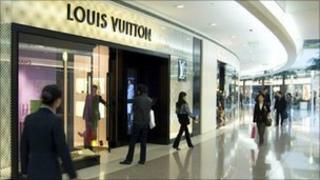 The middle class in China loves brands as much as shoppers in any other country. Unlike New York, London or Tokyo, where people have been shopping in big stores for years, in China the modern consumer market has only really developed over the last decade or so. For many Chinese, particularly those who haven't travelled overseas, it is exciting to see the range of products now available to them. So new is it, though, that although in a city such as Shanghai you see shopping malls opening all over the downtown area, the kind of habitual shopping behaviour seen overseas has not had long to take root here. The malls are often packed with local people, but in many of the stores themselves, you can't help noticing the tills are not ringing. "Many Shanghai consumers consider branded shops to be showrooms rather than places to purchase," says Sam Mulligan, director of the market research company DDMA. His firm has been researching the online market in the city, believing that as one of the country's most advanced consumer markets it offers a picture of what shopping in China in the years ahead will look like. Last year, $82bn (£50.4bn) worth of retail sales in China were online transactions. That is just about a tenth of the total retail sales, but a 95% increase on the value of internet transactions a year earlier. Korea is the most developed online shopping market in Asia, followed by Japan, but China is catching up. The researchers looked at why people here prefer to interact with a screen not a sales assistant. Firstly, they found, there were the practicalities. Retailers cannot keep up with the pace of urbanization. As cities such as Shanghai sprawl further and further outwards in every direction, many people, younger families especially, find they can only afford to live in what you might call "dormitory suburbs", where new housing is cheaper to buy, but where the major retailers have not yet set up shop. If they can buy online, and have the goods delivered to their door, they do not need to make the long journey downtown. "I shop online for almost everything except groceries," says Qian Hu, a town planner who lives in a suburb. "I live so far out it could take me two to three hours to go into town to shop. "If I buy online, it comes to my house the same day. That's how quick the delivery is." If she does not like it, the same delivery-man will come back to pick it up so she can return it, she explains. When they questioned shoppers, researchers found that there was widespread dissatisfaction with the face-to-face experience whilst shopping. Shop assistants are often younger migrant workers from outside the city, hence they are different in age, income and outlook from the customers. Many of them do not know much about the products they are selling, so savvy shoppers buying for example consumer electronics know they need to do their research online before they buy. Once they are doing that, it is not a huge jump to make the purchase online, avoiding the shop assistants all together. "We found that often one person in a group of friends would go to a store to check out a new phone model or tablet computer," says Sam Mulligan. "Then they will go back home and if they're impressed they'll discuss it with their friends using social media. Then the friends can buy. Not everyone needs to go to the store." Without the expensive overheads of a physical store, virtual stores can undercut the High Street substantially. Consumers also believe websites are more reliable, the researchers discovered, an attitude different to that found in European countries or the United States where some people worry that they are more likely to be sold fakes online than in real shops. In China, where there are fakes on every corner it seems, buying directly from the manufacturer on their website makes shoppers feel more comfortable. This does not mean that brands lose money, of course. Many people prefer to buy from brands' own sites. But it does mean big brands might have to rethink their traditional retail model to make the most of the Chinese market, if it is based on selling in real stores. Some are already doing this. The new Apple Store in Shanghai, for example, looks much more like a showroom than a place to buy anything. The researchers claim, based on their study in Shanghai, that China's retail sector will develop differently to that seen in the rest of the world, with e-commerce gaining a stronger foothold and becoming a more important way of selling than the traditional means in the years ahead. The biggest e-commerce website here, Taobao, has a section called Taobao Mall that now hosts 30,000 online stores. Some 53,000 items are sold on Taobao every minute of the day. No wonder you do not see long queues at the tills in many of the shops here. That is because a lot of people are shopping from their sofas instead.